"Now they cuddle up on the couch together." 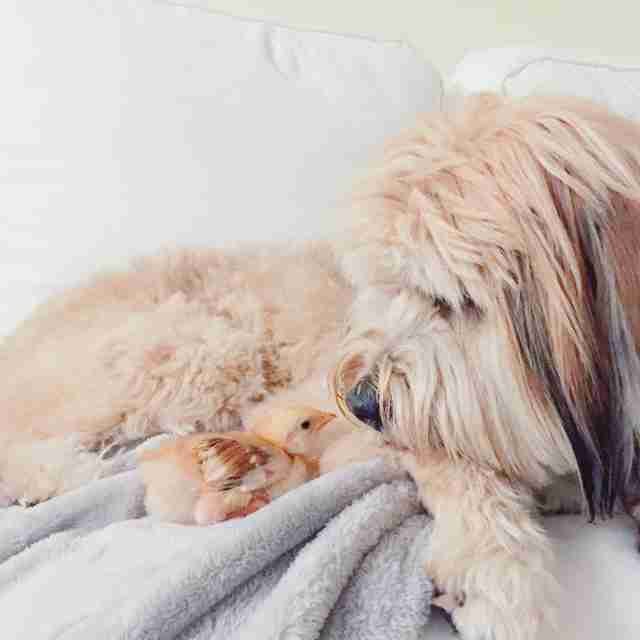 At first, Minnow the dog was "a little bit worried" about Chickpea the baby rescue chicken. That's because Minnow shares a home with a couple of African grey parrots, and "has a healthy respect for birds and their beaks," Minnow's adoptive mom, Abbie Hubbard, tells The Dodo. But Chickpea was persuasive, following Minnow around the house and insisting on being close. And soon enough, a friendship had hatched. 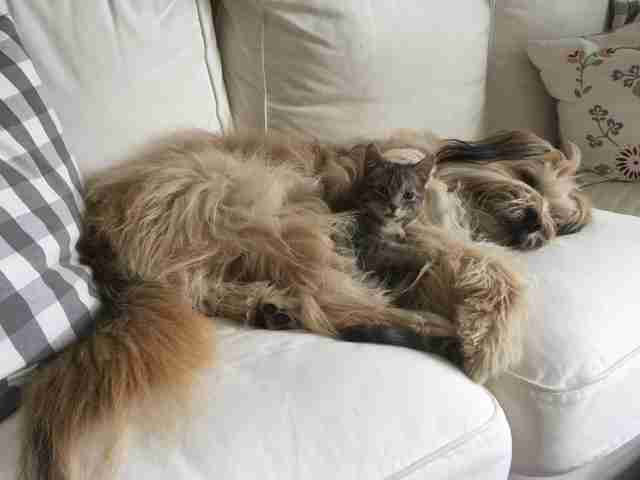 "Now they cuddle up on the couch together," Hubbard says. 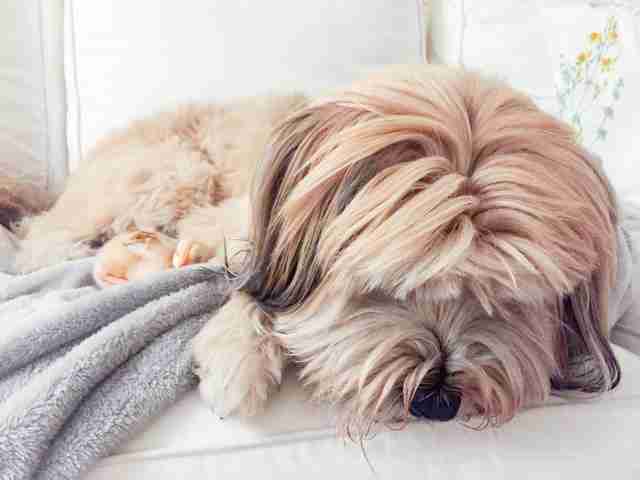 Minnow was rescued from a dog meat farm. She was one of 23 dogs who were brought from South Korea to Northern Virginia by Humane Society International (HSI) in 2015. Hubbard, deputy director for the Animal Welfare League of Alexandria in Alexandria, Virginia, was there when Minnow and the other dogs arrived. Minnow was the last to come out of a carrier. Hubbard explains to people what happened next, using this quote: "Your heart and my heart are very, very old friends." "I can't explain it any other way - we were just meant to be together," Hubbard says. "I pulled her out and it was love at first sight." Minnow has been charming and comforting the fosters residing at Hubbard's home and animals passing through the shelter ever since. 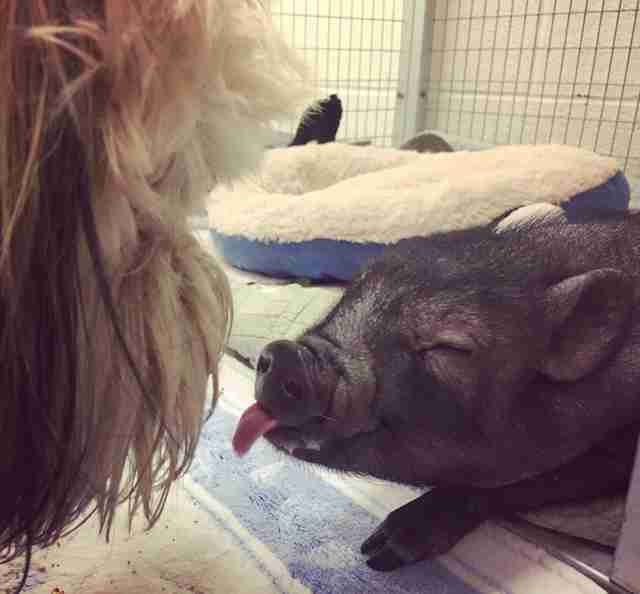 That includes plenty of cats, the occasional pig and even another dog rescued from a meat farm - that dog's name is Hope. "Hope was with us for close to eight months. Minnow showed Hope how to live in a home and to love life," Hubbard says. "It's an incredible gift to be surrounded by so much kindness." 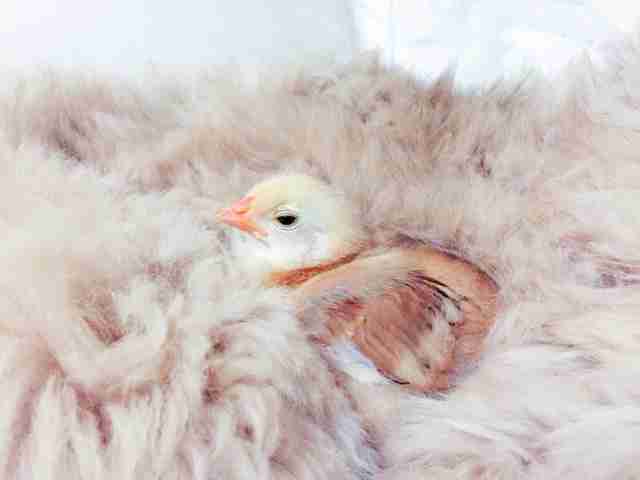 And now, of course, the charming baby chicken. 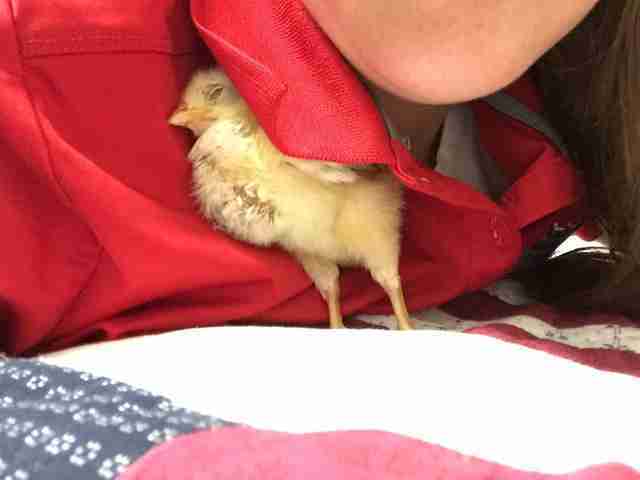 Last week, an animal control officer was called out to collect the extremely young chick - probably 2 weeks old now - who had been found lingering outside a local business's front door. Hubbard agreed to take in the chicken, at least until she's big enough to be permanently adopted. "She is incredibly sweet. She falls asleep in my arms and on my chest," says Hubbard. "A very social bird who has craved contact and comfort from the start. She follows me and Minnow around the house!" 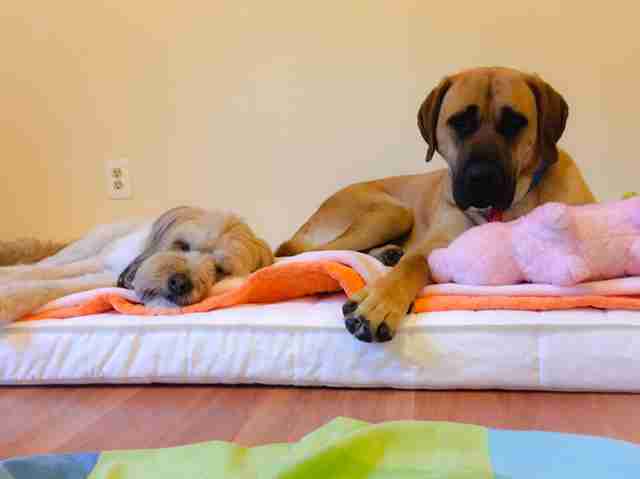 Hubbard is so grateful to the people from HSI who went to the dog meat farm and saved Minnow's life. "Some very generous, courageous souls rescued Minnow from an awful fate," she says. She feels the only way to properly honor what was done for Minnow is for she and her incredible dog to devote themselves to helping other vulnerable animals - like Chickpea - get that very same chance. 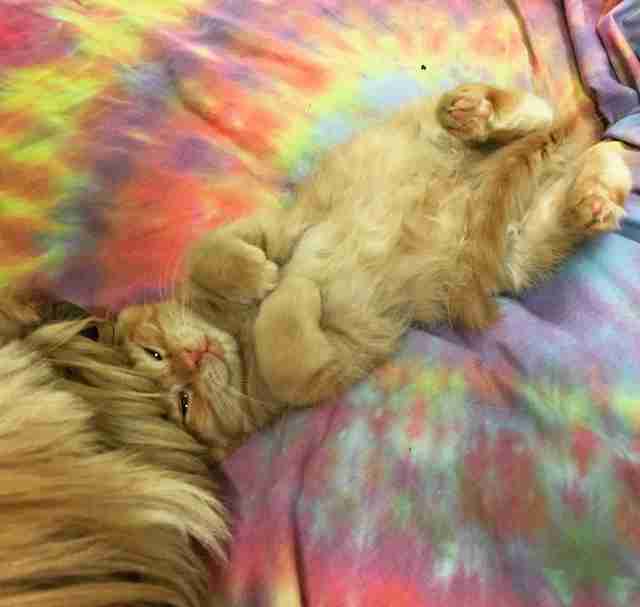 "Minnow has so much love and a joy for life. 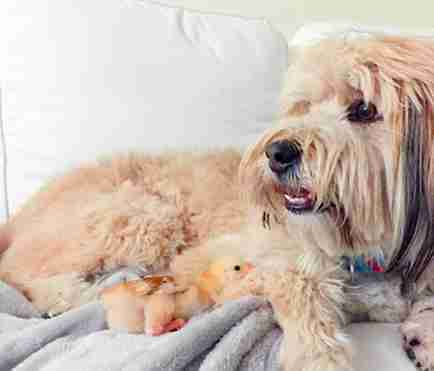 I believe she was infused with the courage and compassion of her rescuers," she says. "She and those that saved her inspire me every day to try to help more animals. It's an incredible gift to be surrounded by so much kindness." You can support Humane Society International to help rescue more dogs from the meat trade.